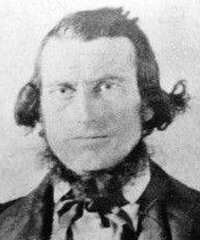 Samuel Pollock, a MORMON SHOOTER and CLUBBER, in 1857, Pollock was a sergeant in Company E of Cedar City. A Mormon convert who immigrated from Donahdue Tyr, in the north of Ireland to Nauvoo, Illinois, and married Elizabeth Reeves. They later moved (via Iowa) to Salt Lake City, then Spanish Fork, Cedar City, Toquerville, and finally to Kanarraville, Iron County, Utah. Descendants and relatives lived in Utah, Arizona and elsewhere. B- 3 Jan 1824, D-1891. They emigrated to Utah in 1850 and Pollock immediately went to work as a laborer. By 1853, they had moved to Spanish Fork in Utah County. Evidently he took Elizabeth Brockbank (1838-1926) of Lancashire, England as a polygamous wife but this marriage was of short duration. By 1855, Pollock and his first wife, Elizabeth, moved to Cedar City in southern Utah where several more children were born. In 1857, Pollock was a sergeant in Company E of Cedar City. has knowingly sponsored, endorsed, and forever immortalized this butcher into history. He likely was only following the orders of his local authorities. The local authorities received their orders from George A. Smith, second in command and directly under church President Brigham Young. Pollock's role on the day of the final massacre was to follow orders: "Mormon's do your duty." *NOTE: Almost all of us descendants of the Massacre Victims feel sorry for the Mormon participant descendants but when they write obvious untruths about their ancestor participant's roll in the massacre or try to justify the massacre like many Mormons do by pointing out Haun's Mill, the Parley Pratt murder, the alleged Joseph Smith martyrdom and the alleged persecutions in Illinois and Missouri. There is absolutely nothing that can justify the cowardly, cold blooded killings at Mountain Meadows, no, not even BRIGHAM YOUNGS'S GREED! The good LORD will make the final judgment not us Nor the LDS Church . These orders are being covered up to this day by President Thomas S. Monson and the LDS church. Follow this link for an example of the cover-up.